On page three, you’ll see that our mission suffered a frightening moment last month, a disaster that was averted by two heroic men and by your prayers. The staff are shaken up, but our work continues, thanks to you, and we are all trying to focus on our many blessings. Among those blessings is the 2007 “Radio Station of the Year” Gabriel Award, our 15th. On October 20th, general manager Ric Schmidt will accept the honor in Los Angeles. Thank you so much for your support and your prayers! 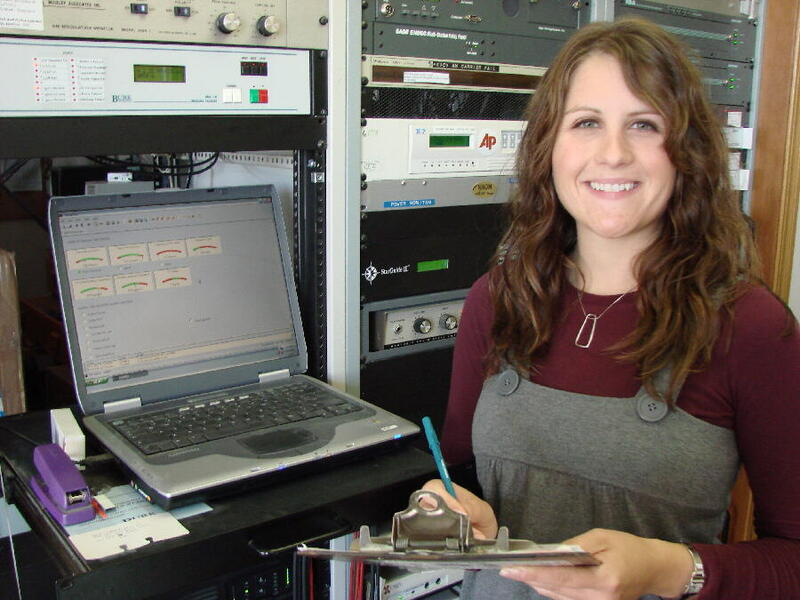 MEASURING UP: (left) Public affairs director Amy Flaherty records transmitter measurements. Originally from Cottage Grove, Minnesota, Amy is into her sixth year as a KNOMer. In addition to daily live announcing, Amy is responsible for KNOM’s interview programs, and works with news on weekly call-in shows. FALSE ALARM: We are so happy it wasn’t the real thing. In Nome, a 16-year-old girl disappeared. As volunteers searched for her, KNOM sent out the police notice hourly. Two days later, the girl turned up. It seems that she was babysitting in a house without radio, and had neglected to inform her parents. We wish every such alarm we broadcast had such a happy ending. 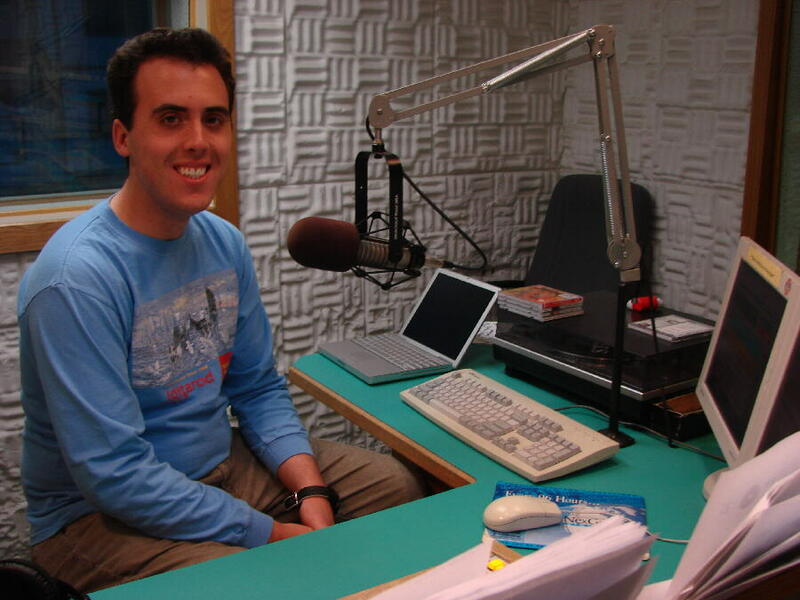 WHEN “LES” IS MORE: We offer special thanks to former KNOM engineer Les Brown, who now lives in Palmer, near Anchorage. You’ll find Les in Nome now and again, straightening out an engineering kink or two. Last month, he performed a detailed tower light check, required quarterly by the F.C.C., and he carefully inspected the tower and guy anchors. Thank you, Les! INSPIRATIONAL SPOT: If you begin each day believing great things can happen, you just might do them. TAKEN FOR A RIDE: (left) When’s the last time you saw an 83-year-old U.S. Senator riding on the utility rack of a 4-wheeler ATV? Senator Ted Stevens and colleague Lisa Murkowski personally hosted US Education Secretary Margaret Spellings on a Bush tour that included Shishmaref, Nome, and Bethel. Behind Stevens, on the ride from Shishmaref’s air strip to the school is aide Aaron Saunders. Driving is Inupiat Eskimo Dennis Davis. KNOM news director Paul Korchin was there for the story. 122 miles north of Nome, Shishmaref is in danger of destruction by the sea. In living memory, it has lost 100 yards of beach. Its people, whose ancestors lived in the area for more than a thousand years, do not want to leave it. They’re trying to find funds to move the village to a safer nearby location so that they can continue to feed their families by traditional subsistence hunting. 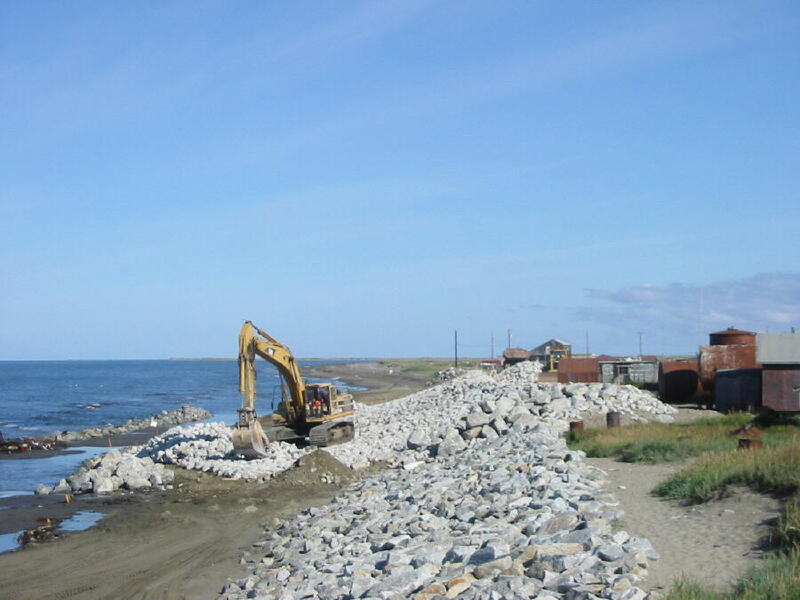 (Left) The Army Corps of Engineers beefs up Shishmaref's seawall, with the often angry Chukchi Sea in the background. RETREAT! In Anchorage, KNOM spiritual advisors Fr. Armand Nigro, SJ and Fr. Vince Beuzer, SJ are planning for retreats next summer, weekend length, as well as 5-day, 8-day and 30-day. If you are interested in combining a spiritual journey with a trip to Alaska, please contact the Holy Spirit Retreat House at 907-339-2486. On the web, you can learn more at www.holyspiritcenterak.org. RECENTLY SPOTTED: So far this year, KNOM has broadcast about 28,300 inspirational spots. Some, like the one above, are simple suggestions. Some are profound. Many are prayerful. We’ve aired an equal number of educational spots, on a wide range of topics. These range from pure education, such as science, to addressing the many social ills of our region, such as alcoholism, suicide and home violence. Thanks to you, we’re working hard to make a positive difference in our remote listeners’ lives. WILLFULLY: If you haven’t already, please consider adding KNOM to your will. With prayer, we place all bequests into funds that are used only for future major improvements, and to see the mission through unforeseen emergencies. INSPIRATIONAL SPOT: Learn something new today just for the sake of learning. Say something nice to someone just for the sake of the saying. Do something extraordinary today just for the sake of the doing. Our good deeds do not need reason, reciprocation or rationale. Living well is its own reward. INSPIRATIONAL SPOT: What happens to us is not as important as what happens through us. 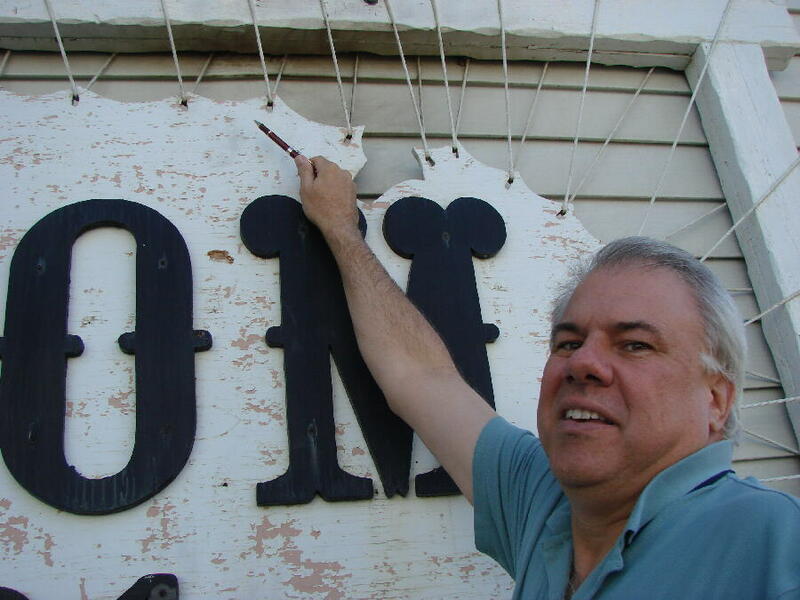 SCARY: (left) KNOM general manager Ric Schmidt points to a charred area on the KNOM sign. You may find this hard to believe: Last month, the KNOM studio was attacked by a deranged man, using Molotov cocktails, gasoline-filled bottles with cloth wicks. Fortunately, his first couple of bottles bounced off the sign and exploded on gravel in front of the building. Two neighbors, who happened to be standing at their front door, chased the man away, saving the station. He left behind three additional gasoline bombs on the street as he fled. The entire Nome police department and about twenty volunteer firefighters joined in the search for him. Every one of them stopped by the studios to wish KNOM well. “This is not going to happen on our watch,” said Nome police chief Paul Burk. Police have the arsonist in custody. Why attack KNOM? The man has the delusion that about eight years ago, KNOM aired a program that criticized his personal life in earthy terms. He appears to have been aiming at the Studio A window, though he has attacked the KNOM sign in non-fiery ways, before. We ask that you add this man to your prayers, and continue praying for our mission and staff. And we thank you for your prayers, which we believe helped to protect us. Thank you! GETTING AROUND: Two months into her volunteer year, Kristina Proctor was escorted by Paul Korchin 94 miles east to the village of Elim, to cover a meeting concerning possible uranium mining north of the village. Unlike Nome, Elim has trees. “This place was gorgeous!” Kristina says. Meanwhile, Amy Flaherty introduced new volunteer Laura Davis to village travel and Alaska Native culture, on a 110-mile trip to the most westerly point on the North American continent, the tiny village of Wales, which was hosting its annual Kingikmiut (king-GIK-myoot) festival. “Everyone was really friendly and hospitable,” Laura says. About the same time, Tom Busch was 183 miles south of Nome, repairing the KNOM translator in the village of St. Marys. “As I stepped off the plane,” Tom says, “the first voice to greet me was Laura Davis’ from a radio in the bush airline’s small terminal.” The airstrip is on top of a hill, and unlike the village, receives KNOM well. INSPIRATIONAL SPOT: Help us, Lord, in the laws we pass, in the rumors we stop, in the risks we take, in the convictions we show, in the issues we face, in the sins we confess, and in the creeds we try to live. 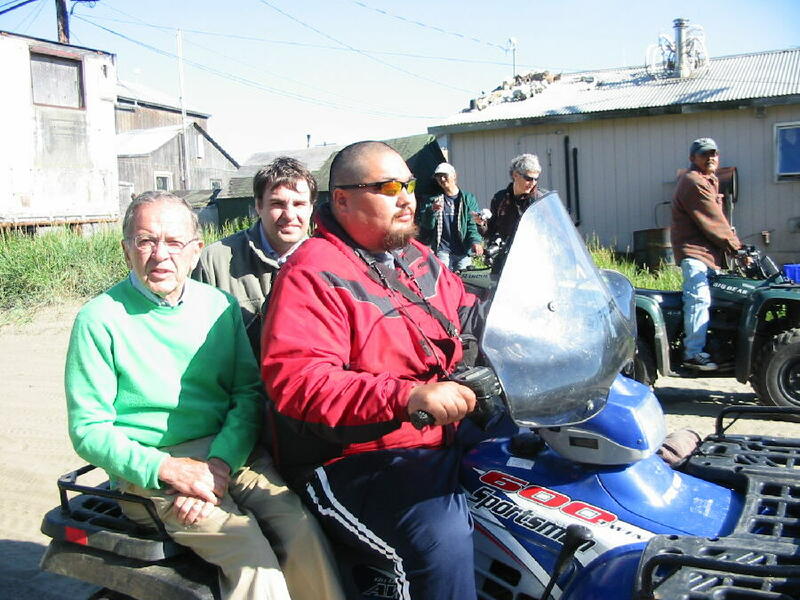 EARLY BIRD: (left) For most western Alaskans, their first cheerful morning greeting is from volunteer spiritual director Dave Dodman, Dave coordinates KNOM’s inspirational spots and doubles as KNOM’s 6 AM – 10 AM deejay. Originally from Rahway, New Jersey, the friendly and helpful Dave is a graduate of Harvard University with a degree in music. FORTY YEARS AGO: In October 1967, the would-be radio mission sends out 550 copies of Nome Static Transmission 11 and receives 46 contributions in return. Mindless of a violent blizzard, Nome children climb over snowdrifts to trick or treat. SPEAKING OF STORMS, autumn can bring Nome’s most dangerous weather, as remnants of Pacific typhoons charge into the Bering Sea and work their way north. While any month can bring bad weather, these fall storms can raise the ocean level at Nome by twenty feet or more. The KNOM studios and transmitter are safe, at about 25 feet above sea level, but many areas in the town and surrounding villages are in harm’s way. It’s not unusual to lose electric power, but thanks to our emergency generators, at these times, KNOM becomes the region’s beacon for emergency information. VOLUNTEERING: It’s in the blood of KNOMers. 2004-05 volunteer Liz Recchia has just joined the Nome Volunteer Fire Department, following in the footsteps of 2003-04 volunteer Anna Dummer. Recently, Amy Flaherty, Ric Schmidt and a few Schmidt children were out to sea fishing, as part of a program to help feed the region’s hungry. Ric, incidentally, heads Nome’s Employer Support of the Guard and Reserve, and serves as long-time treasurer and past president for Nome’s Rotary Club. Tom Busch is secretary for the Rotary district which covers Alaska, the Yukon Territory and Russia east of the Ural Mountains. Dave Dodman is cantor for Nome’s St. Joseph parish. KNOM program director Kelly Brabec is Nome’s volunteer coach for the Special Olympics. Yes, it’s in the blood. Once more, we thank you sincerely for your help and your prayers. We don’t like to beg, but we must mention that we are barely, barely paying our bills right now. As always, we offer you and all of your intentions a place in our daily prayers. God bless you for your generosity!